Even though PyCharm 2016.3 was only released last month, we haven’t been idle, and we have been working hard on improving PyCharm. If you want to have a sneak peek at what’s coming in the next version of PyCharm, you can download our Early Access Program (EAP) versions which we will be releasing regularly from now on until the release. Zero latency typing as a default. 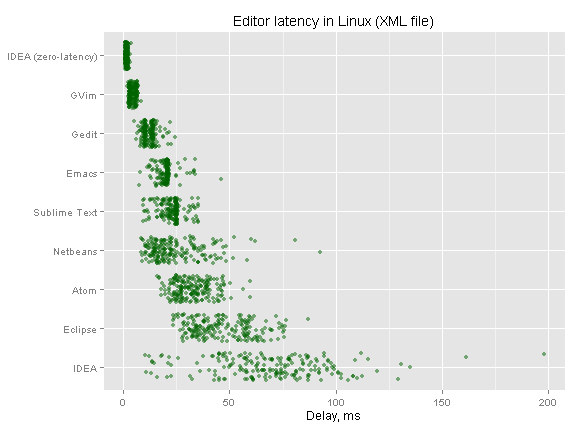 Pavel Fatin, a developer at JetBrains, has done extensive research into editor latency. With his improvements, typing in IDEA-based IDEs (like PyCharm) is now faster than it is in editors like Atom, Sublime Text, Emacs and Notepad++. Semantic highlighting assigns colors to function parameters so you can see at a glance where they’re being used in the function. Breadcrumbs let you know where you are within your project. Very useful when you’re working with deep hierarchies. Better VCS log viewer: you can now search a commit using regex, and choose whether or not the search is case sensitive. Web development improvements from WebStorm: Mocha test integration and ECMAscript 6 array intentions. See the WebStorm blog for more details! We’d like to invite you to try this EAP build and to let us know how you like it. If you encounter any issues with the EAP you can report an issue on our issue tracker. You can also reach out to us by commenting on this blog post, or by tweeting us. If you’d like to let us know about a feature you’d like us to develop, please let us know as well! Finally, we’d like to wish you a happy 2017, we hope your code in the next year will be better than ever before! This entry was posted in Early Access Preview and tagged newsletter. Bookmark the permalink. build.txt inside pycharm-professional-171.2014.23.tar.gz says “PY-163.10154.45” and the IDE claims to be 2016.3.2. Are you sure the correct build has been packaged? It looks like the .tar.gz archive for PyCharm Professional 2017.1 EAP available at the EAP page contains the correct version 171.2014.23. Could you please double-check that you’ve downloaded the correct file? This is fantastic news on the latency! Sadly it won’t affect me much since I’m a slow typist. The delay that concerns me is usually load times. A lot of that (for a developer) is fixed just my getting an SSD and can’t be helped via software, I suppose. It is awesome that assigning a color to each function parameter. But why not hightlight “function call” and “variable” like other IDEA-based IDEs? I think it is necessary. I just checked with the development team: We don’t highlight function calls, and neither does IntelliJ IDEA, we do highlight local variables. However, we don’t highlight class variables, as you could reference it with a qualifier, and we want to be consistent with other qualified references. Could you please include latest version on http://confluence.jetbrains.com/display/PYH/JetBrains+PyCharm+Preview+%28EAP%29? I’ve just downloaded it, hoping that it’s gonna improve my experience with the sluggish editor. Unfortunately, I’m seeing no improvement at all. Thank you for your report, we’re looking in to it! Great stuff; you guys are totally killing it with this EAP cycle! Again! If I could make a very low-priority suggestion: It would be nice if toggling the Breadcrumbs bar on and off could be a command that one could bind to a key (or even just access from the Find Action popup). It takes up a valuable line of screen real estate, and it would be nice to be able to turn it on or off without a trip to Preferences. Nice improvements! I will take a look and give my opinion later. Overall, really like the enhancements. However, in Pycharm 2016, when you right-clicked on the tab with the filename for an opened file, you were able to click on run/debug the program (with a shortcut reminder for Ctrl-Shift-F10 for run). In Pycharm 2017, the run/debug menu item is no longer present when I open .py files. It is present for .html files. Is this intentional (or am I doing something wrong or have an incorrect settting)? Again, though, really like Pycharm 2017. I just checked, I have the ‘Run’ option in the context menu after right-clicking on a tab. What type of project are you using? Which Python interpreter have you configured? Figured out what the error was. It was previously identified as an issue in a previous build of Pycharm (2010). In the file, I had a function named create_test_data(). The presence of the word ‘test’ in the method name caused the issue. Pycharm interpreted the file as a test case file or unit test file instead of an executable. The context menu is different for the two types of files.